The email address we have for Jamilyn is no longer valid. 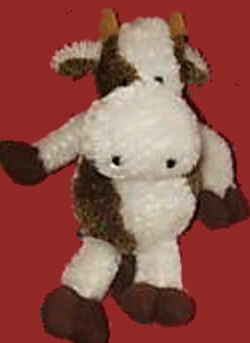 I am looking for a DanDee floppy stuffed cow that is about 12 inches high. It is brown and white and has short brown horns. My son Damian and I were at Walmart on the clearance aisle and there was the cow. He held out his arms, he was a little less than a year old at the time, to get the cow. Of course, that was the only one there. He is now 17 months old, and he doesn’t go anywhere without “Cow”. I have searched the internet over and back again, but can’t find one anywhere for sale. If anyone knows where I can get one, it would be greatly appreciated. I try Ebay and Craig’s List everyday. Here is one in excellent like new condition with tags still attached. Thanks, Susan. Their email didn’t bounce, but we’ll keep our fingers crossed that they see it, considering how old this post is. It would be a shame for them to miss it. That’s what I was afraid of. Their email address bounced. I’m so sorry for you and for Jamilyn.